Tom Westley hit 105 to help leaders Essex seal a 63-run victory over Kent who were skittled in just 15.5 overs. Westley was the pick of the batsman for Essex who lost opening duo Mark Pettini and Jesse Ryder for just one run. Having set 209, they made light work of defending their total with Ryder the pick of the bowlers finishing with figures of 5-27. 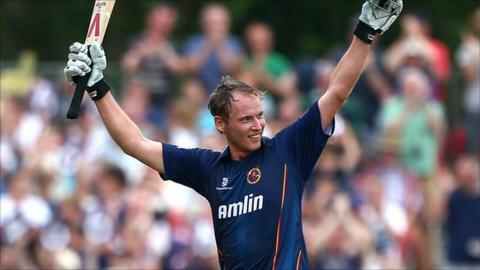 Sam Northeast hit 41, but Essex rattled through their opponents to guarantee a place in the T20 Blast quarter-finals. Tom Westley said: "It wasn't all down to me, the way that Jesse Ryder bowled was excellent. "We lost a couple of early wickets but we have so much batting in this side that we are always confident we will post a decent total. I felt in good nick and have been striking the ball cleanly in all formats but it was very satisfying to get a T20 century in front of our own fans." Kent all-rounder Darren Stevens said: "We got off to a good start getting both openers out cheaply but Tom Westley played beautifully, fair play to him. We know outstanding innings in T20 is always going to make things difficult for the opposition and so it proved."